Anyone for a trip over the weekend? 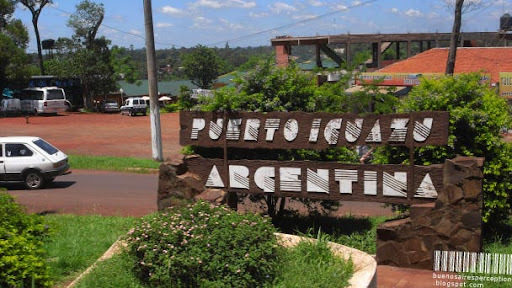 Well, Puerto Iguazú might be too far from Buenos Aires for just a weekend especially for those going by bus. Nonetheless, the sleepy village at the north end of Argentina is one of the top destinations in South America. From here you can easily explore the Iguazú Falls and discover every single one of the roughly 270 individual falls. You rather not plan too much for one day, as there is plenty to dig into. And trust me, natural beauty tires you out. Un sólo día no alcanza, and neither does a weekend. 270 falls! I had no idea that Iguazu was that broken up. I knew it was big ... but 270 must cover square miles of land. 270 falls. Well if you start now and snap one fall per day you will be done in nine months time! Well, 270 waterfalls would keep anyone busy for a while. It must be a fantastic place to visit! Sounds like a super retreat for the weary. What does Iquazu mean? It's true that natural beauty tires you out, but it's a good tired. It's an interesting little town, a bit more real-life than the luxury as Sheraton resort (not that we objected to it). I remember going into a tiny sport shop to buy some Argentine futbol jerseys for kids back home. The owner tried to give us some of our change in Brazilian reals. No use to us.